Speaking at a ceremony honoring Righteous Among The Nations, Obama says anyone confronted by anti-Semitism should behave like they did. President Barack Obama on Wednesday became the first American president to speak at the embassy of a foreign country, when he visited the Israeli embassy in Washington, D.C., and spoke at the first ever ceremony in the United States posthumously honoring four Righteous Among The Nations. Coinciding with International Holocaust Remembrance Day, the event honored two American and two Polish citizens. In his remarks, Obama pointed out that anti-Semitism is once again rearing its ugly head and said that everything must be done to prevent it. “As we honor the newest of the Righteous Among the Nations, we make real the call to never forget. Our children must know this chapter of history, and that we must never repeat it,” he said, as he recalled visiting the Yad Vashem Museum in Israel and taking his daughters to the Washington Holocaust Museum. "Under the same circumstances, how would we act?" he asked, in reference to the four honorees as Righteous Among The Nations. 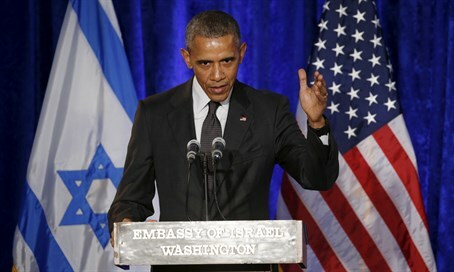 Obama then said, "We must confront the reality that, around the world, anti-Semitism is on the rise. We cannot deny it." "When we see Jews leaving Europe… and attacks on Jewish centers from Mumbai to Kansas; when we see swastikas appear on college campuses, we must not stay silent. An attack on any faith is an attack on all our faiths...on the very idea people of different backgrounds can live and thrive together," he added. "I’ve made sure that the United States is leading the global fight against anti-Semitism,” said Obama, who also reiterated that "America’s commitment to Israel’s security remains, now and forever, unshakeable." He particularly noted the words of one of those who were honored, Master Sgt. Roddie Edmonds, the first American soldier to be recognized as Righteous Among The Nations. In January 1945, the Germans announced that all Jewish POWs in Stalag IXA were to report the following morning. Edmonds, who was the highest ranking solider in the American section of the camp ordered all his men to fallout the following morning – Jews and non-Jews alike. Siegmann took out his pistol and threatened Edmonds, but the Master Sergeant did not waver and retorted, “According to the Geneva Convention, we only have to give our name, rank and serial number. If you shoot me, you will have to shoot all of us, and after the war you will be tried for war crimes.” The Commandant turned around and left the scene. As Obama said in his remarks on Wednesday, “We are all Jews” is what people must respond, just as Edmonds did, when witnessing anti-Semitism. “We are all Jews because anti-Semitism is a distillation, an expression of an evil that runs through so much of human history. And if we do not answer that, we do not answer any other form of evil,” said Obama. “We are all Jews. We know that we’ll never be able to wipe out hatred from every single mind. We won’t entirely erase the scourge of anti-Semitism. But like the Righteous, we must do everything we can,” he stressed.